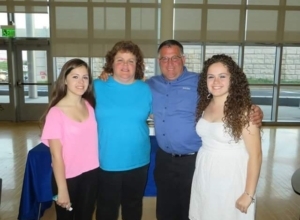 Mark Celone, age 51 of Derby, CT was diagnosed with stage IV lung cancer in March 2016. Prior to this diagnosis Mark had not been feeling very sick but did have a huge lump in his bicep and had been experiencing some chronic back pain but didn’t think anything of it. After his wife Kimberly pushed him to go to the doctor he went and saw an orthopedic and had an MRI performed. Doctors immediately performed a biopsy on his arm. Upon receiving the results it was confirmed that Mark had metastatic cancer. It is based on these tests that doctors found that Mark had stage IV lung cancer. They also found metastasis in his back, chest and abdomen. Mark began radiation treatment in April 2016. In May 2016, he began chemo, which was based on a clinical trial. The chemo was very tough on him but he still continued to work. On his second round of chemo in June 2016 he had a terrible reaction at work and got very sick. He drove himself home from Stamford. Upon his arrival home he went straight to bed. He woke up at 2:30am vomiting. He thought he was experiencing issues from chemo but then realized he was having a heart attack. His wife called an ambulance from the time he began experiencing symptoms to the time he was on the operating room table was 90 minutes, but doctors were able to make the repair and save his life. After his heart attack he stopped working and has been on disability since. Subsequently, he was recently terminated from his position. In August 2016, Mark was diagnosed with blood clots and placed on two blood thinners. He was told however, that his cancer was inactive at this time. In March 2017, after having scans he was told his cancer is active again but showed stabilization. In April 2017, they found two more spots on his lungs. Mark and Kimberly have two daughters, Alyssa, age 20 and Nicole, age 18. The family has not been on a family vacation in 10 years and with Marks illness doing a family trip is the last thing on their minds. Mark would love the opportunity to get his family together and go on a cruise, which they have never done.